Gather together in one place every man, woman and child in Ontario and Quebec. It is the immensity that overwhelms you in China today. The size of the new airport in Beijing, the crowds on the streets, the traffic and the noise. And perhaps most of all, it is the energy from the 18 million who live in Beijing and the 1.3 billion people who populate China. The Olympics were a triumph for China. Veteran Olympic observers told me it was the best-organized games ever. While security was sometimes a little exuberant and the food available at the events was awful, the overall experience was exhilarating. There was tremendous warmth from the people in Beijing. In many ways this was their country’s modern coming-out party, and it was a great success. I got to see the men’s gymnastics final, when Yang Wei won the gold medal—18,000 Chinese cheering hysterically for their hero. 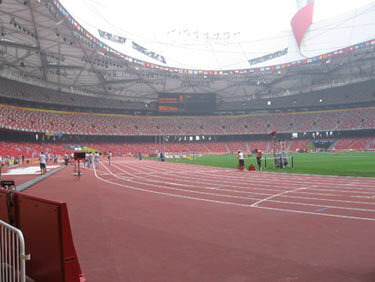 I also lucked out and got a private tour of the Bird’s Nest—91,000 seats in a fantastic facility that cost half a billion dollars. The Olympic Green was the major site for the Games, and it was enormous—more than 2 km long. The Water Cube is a couple of hundred yards away from the stadium, and it is truly astonishing—you probably saw the thin skin on this Aquatic Centre which changes colours. Inside I watched Canadian Ryan Cochrane set an Olympic record in the 1500m. He went on to capture a bronze medal. Also near these two primary facilities was the International Media Centre—most of the studio pictures you saw on TV originated from this modern broadcast facility, and I was honoured to spend part of a day in the media centre. NBC’s Today Show was broadcast live from there. It is a 12-hour time difference, so many of the finals were in fact held in the morning to accommodate the North American TV schedule. CBC and NBC have been happy with their ratings—how about 800 million Chinese watching the Opening? While you probably saw more of the actual Olympics than I did (getting to and from events was long) there is no question the atmosphere is charged when you’re there. Watching tennis greats Nadal and Federer up close was amazing. Crowds were big for all events—I was astonished one rainy, miserable afternoon to see on Chinese television thousands of Chinese cheering on their favorite in the quarter-finals of women’s archery! There were—hold your breath here—one million volunteers for these Games. Smartly dressed, bright, attractive, young—and anxious to help. For example, when rain did come, they calmly handed out thousands of free disposable rain jackets. By comparison, the Vancouver Games will have about 20,000 volunteers in 2010. An hour and a half north of Beijing lies part of the Great Wall, which one walks carefully as it is very steep and hilly with steps that are uneven and rough. This was apparently deliberate, to confuse invading armies—and it certainly made for dangerous trips by tourists from around the world. I was surprised at the mountainous terrain, and the forest that blankets the Wall, but what an experience! And in one of those delicious moments of irony, I bought a T-shirt at the end of my section of the walk proudly proclaiming that I had climbed on the Great Wall—and then laughed when the tag said ‘made in Russia’! Construction on The Forbidden City started before Columbus sailed for the new world. It is an immense feat of engineering and architecture. One million labourers, one hundred thousand artisans, and it was completed in fourteen years. It has 9,999 buildings (only the gods can have 10,000, if I understand the history correctly) and the stories of palace intrigue are legendary. To walk on the same stones that emperors and their concubines trod for hundreds of years, and to realize the decisions that were made there affecting millions of lives, is a humbling experience. Beijing today is a modern, vibrant city. Lots of money for some, and an emerging middle class. Few bicycles, many cars. Pollution was an issue the first couple of days, but after that it was blue skies. There is a growing awareness of environmental issues, and I suspect that young people will continue to drive China’s improvements in this area. As with our cities in North America, their problems will not be solved quickly. Food is wonderful. Dining comes from the eight major cuisines of China, as well as other countries. Restaurants are often located on an upper floor of a building, rather than street-level. Coke owns the soft drink market. McDonalds, KFC and Pizza Hut have a strong presence. There is great interest in western culture, but that is firmly tempered by the emerging Chinese confidence and commitment to their own culture and the arts. They are fashion-conscious, everyone has a cell phone, they’ve closed one of their major downtown streets for a pedestrian-oriented mall and thousands throng that street at night. It is a dynamic city. The people displayed nothing but warmth, courtesy and curiosity during my time in Beijing. Many people wanted their picture taken with me (something about “Big guy with dimples”…sigh.). I handed out lots of London pins. Canada is well-respected, partially because of the work of Dr. Norman Bethune with Mao during the Long March; all school children in China to this day learn of his work. The recent investments in infrastructure are massive—something like $40B. The subway system costs two yuan (a few pennies) to ride, the airport is the best and most efficient I’ve ever seen, and new toll roads are providing modern highways. They have six ring roads now, and plans for eight. A new map is issued every eight months as the city grows so quickly. China today is an amazing country. Its economic growth is about 8% a year. They are a major economic, social, political and now athletic force in the world. 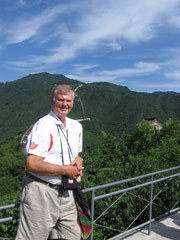 Next week, I’ll look at some of the remarkable history of China, including the terra cotta warriors at Xian.